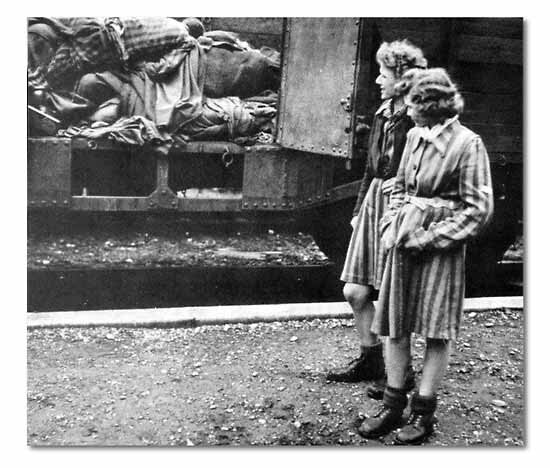 Two Jewish girls, dressed in striped-prisoner garb, look distastefully at car loaded with NAZI victims. To the 143rd Infantry befell the task of guarding Festung Landsberg, the prison in which Adolph Hitler spent 14 months in 1923-24, writing his infamous "Mein Kampf." Landsberg prison under the Nazis confined both criminals, as judged by German law, and political prisoners, indiscriminately. 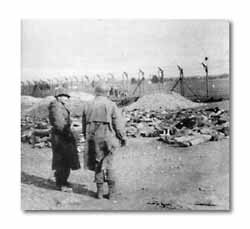 When the Yanks arrived, the fortress, built to accommodate 500, was crammed with 1,400 pathetic prisoners of many nationalities. The American Control Commission separated political prisoners from the criminal cases and returned many of them to their homelands. Some of the latter had experienced indescribable privation in other camps and were confined to the sick bay. Doughs rated as most pleasant in the prison, the steamheated room in which Der Fuehrer dictated to Rudolph Hess.